We buy our wrapping film from Protos Packaging as the prices are very competitive and the service is excellent. 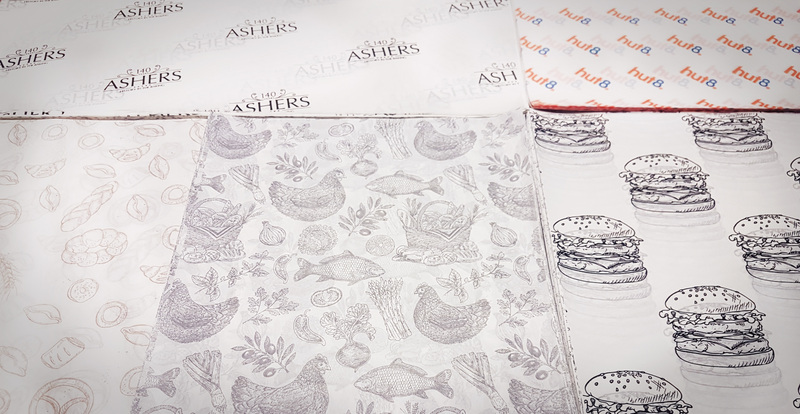 The most recent addition to our product offering…custom printed greaseproof paper sheets and rolls! Available in 34gsm bleached (White) and 40gsm Unbleached (Brown) our papers are premium quality and great for a multitude of food and gift wrap uses. Whether you want to strengthen and enhance your brand with our custom printing facilities or pick from one of our off-the-shelf designs – as a manufacturer we’re able to offer the most competitive pricing in the industry. Why not request a sample pack and see for yourself what makes our custom printed greaseproof so popular? As a manufacturer we are able to offer the largest size range in the industry, all the way up to 1000mm x 1000mm+. You certainly can, fill out the form below and we’ll get a sample pack posted for you! We can also create digital mockups for you completely free, so you get to see how your design is going to look before incurring any cost. Whether you’ve got detailed branding guidelines, a current design or just a logo our in-house marketing team will be able to provide a full design service to help strengthen your brand and maximise your return. Once we have an idea of what you would like we would create several examples for you to pick from and ensure you’re completely happy before heading to print. We’re able to print up to 4 spot colours or unlimited process colours on white, brown or silver papers in-house. We also have dedicated print partners to increase our offering to 8 spot colours if needed, just get in touch. If you’re not sure how many colours your design uses just send us a copy and our friendly team will work it out for you. Our continual investment in printing technologies, wealth of experience and stringent quality control (certified to AA grade BRC) ensures that we are able to offer some of the best prints in the industry. The average lead time for most custom printed orders is around 2-3 weeks from artwork approval, however if you’ve got an urgent deadline you need to meet get in touch and we’ll do our best to help. We’ve got many customers out of difficult situations before and we’ll do it again! No. Only joking, yes, that’s exactly what it’s designed for! Our greaseproof paper is designed to be impermeable to fat, grease and oil – meaning that your product presentation and branding is kept exactly as you want it. If you have any questions regarding suitability just get in touch and we’ll be happy to advise. Our greaseproof paper is completely suitable for microwave, oven and freezer use. We always recommend keeping the printed side of the paper away from all foods when cooking or storing products such as frozen food.